Not All Role Models Need Be Positive "Why are we expending so much angst worrying about the character of our well-muscled celebrities?" Frank Deford asks, as he reflects on the recent suspension and apology of Pittsburgh Steelers quarterback Ben Roethlisberger. At a certain point, don't you just stop caring whether athletes behave? 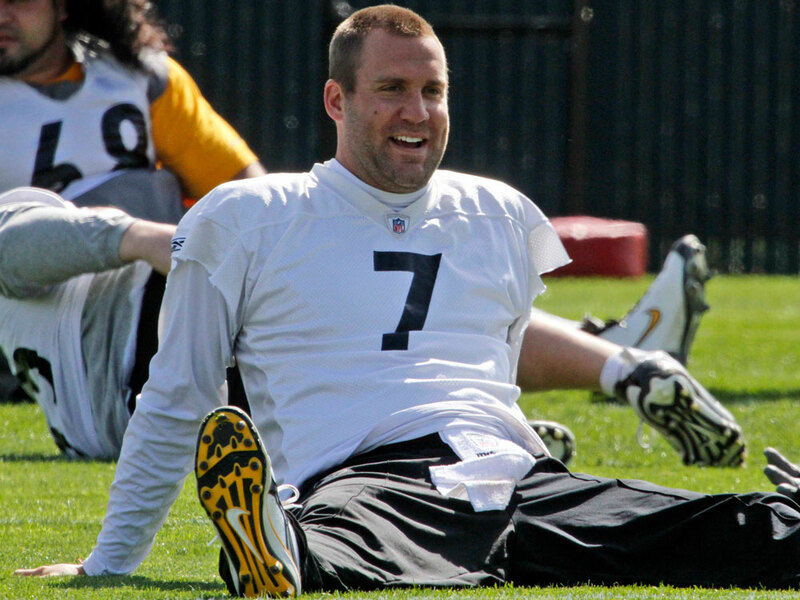 Pittsburgh Steelers quarterback Ben Roethlisberger during a recent team practice in Pittsburgh. When NFL Commissioner Roger Goodell announced the player's six-game suspension, he said Roethlisberger's behavior could not be described as "admirable, responsible or consistent with either the values of the league or the expectations of our fans." For another perspective on the state of athletes as role models, read why commentator Linda Holmes says it does matter what Roethlisberger may or may not have done. Pittsburgh Steelers quarterback Ben Roethlisberger apologized Monday for his behavior last month in a Georgia bar, where he was accused of sexually assaulting a 20-year-old girl. The apology came after the football star was cleared of all charges in the case, and followed a National Football League suspension taking him out of the first six games next season. But at a certain point, don't you just stop caring whether our athletes — who for some reason or other are always called "role models" — don't you just stop caring whether they behave? I mean, it is hopelessly apparent that Roethlisberger is a perfectly dreadful person, prone to reprehensible behavior whenever he is let loose from the sanctioned violence of the gridiron. As Knute Rockne said many years ago: "The only qualifications for a lineman are to be big and dumb. To be a back, you only have to be dumb." To what earthly benefit is it to suspend Roethlisberger? Does it teach little, impressionable children a lesson? Is it going to make other football players pause and think about being a role model late at night when they are on the cusp of committing mayhem? I mean, let's give Roethlisberger credit. At least he wasn't packing a firearm like so many of his athletic brethren do when they are out taking the air these evenings. No doubt his enforced vacation will hurt the Pittsburgh Steelers, but then, somebody has to lose, so it will help some other team. The NFL will not be affected a whit, except in the sanctimonious sense that it can pat itself on the back for standing foursquare in support of goodness. What always confounds me is the premise that Commissioner Roger Goodell cited — as do the other so-called czars of sport — that their players "have to be held to a higher standard." But why? Why, pray, of all people, are athletes, pretty much alone in our society, expected to be sweeter than the average angel? It is politicians and clergy and those maestros of finance on Wall Street who ought to be held to a higher standard. Why aren't they ever called "role models?" Why can't some tearful little impressionable tyke sob, "Say it ain't so, Goldman Sachs, say it ain't so" — and thus change the pecking order in our cultural mythology? And speaking of role models, it's nice to know that Tiger Woods has issued another sincere apology, so bummed out, as he is, that he was surly and graceless and cursed on the course at the 2010 Masters golf tournament, all the little nasties he'd assured us he was going to take care of in prior sincere apologies. Perhaps Roethlisberger can join Tiger in his mystery rehabilitation. So let me close this jeremiad by showing how we can get around this emotional dilemma: We simply acknowledge that not all role models have to be positive. After all, by definition, the term just means modeling a role, exemplifying a position. Dracula, for example — was there ever a better role model for nefarious behavior? No. So once we understand that and accept that all our athletes are role models, we can stop fretting and get back to the games.